A survey of remains at the nests of Greater Black-backed Gulls looked at their diet. This year they have mostly been eating Rabbits, Manx Shearwaters and rubbish - as usual. Some more unusual finds include an HP sauce sachet, some orange string, a foil pie case, a Turkey leg, a lolly-pop stick, some bits of glass and a blue latex glove. Euurgh! More unsettled weather meant that the boat couldn't run on a couple of days this week. Some lucky people on one boat that crossed got great views of a big sunfish just outside North Haven - the third sighting so far. Soggy weather has seen lots of mushrooms popping up, in particular the first Parasols of the year. With many of the other seabirds now gone from Skomer it is a good time to appreciate the 500 pairs of Fulmar that breed here. Their chicks are easily seen now. The adults laid a single egg back in late May and will have incubated it for a staggering 7 weeks! The chicks would have hatched back in early July but are closely brooded by the adults for the first week or so and we didn't see the first chick until July 8th. Now they are growing and easily visible sitting on their nest sites near the tops of the cliffs. Fulmar choose open ledges or hollows to nest on and a few on Skomer are nesting on top of old Crow or Buzzard nests. The chicks are a gorgeous soft grey and covered in fluffy down, the first few are just starting to loose their down and will fledge about 7 weeks after hatching, which will be mid to late August. The adults revel in all the windy weather we have been having this week. They float up and down on the updrafts along the cliffs, demonstrating an awe inspiring control. They are beautiful, graceful birds but this elegant image is spoilt when they open their bills - they a have a coarse, cackling call. They are also infamous for spitting stinking, fishy oil at any one foolish enough to get too close to them. The Fulmar story is a really interesting one. Back in the 1800's they were only found in the UK on the remote islands of St Kilda. But over the last 200 yrs they have spread south as far as northern France. 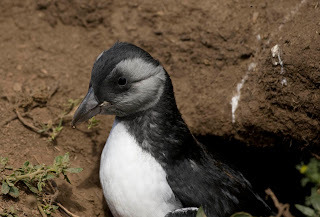 The first breeding record for Skomer is from 1960 when four pairs were known to breed, now there are over 500 pairs. Thats a 125 fold increase in the last 50 years! Gusty wind and torrential showers again this morning led to one casualty (apart from the sodden humans! ), a young Kittiwake was found blown in-land. A bit of a rest and a helpful launch into the air was enough to get it going again and it soon flew off. Persistent bad weather, in particular on-shore winds, at this time of year often blow exhausted young birds ashore. A lovely sunny day yesterday saw the next wave of Painted Ladies in flight (the off-spring of all those migrants a few weeks back) and the few bramble bushes on the island were alive with Peacocks, Red Admirals, Graylings and Small Tortoiseshells. Glorious sunny weather has meant the admin work has been rather neglected, so apologies for the lack of updates. The bird highlight was a Serin seen flying over North Haven one evening. This is just the fifth time this bird has been seen on Skomer and the first record since 2003 (the one prior to that being 1993). This was spotted by Dave B and was a just reward for him as he was out working all evening, whilst the rest of the staff and researchers were having a BBQ and not working. That'll teach us! There are big spring tides this week with nearly a seven metre vertical difference between high and low water. The Marine Nature Reserve team have been out doing their intertidal surveys around the Island and the mainland. Learn more about the Marine Nature Reserve (we are one of only 3 in the country!) and the work of the team by following the link to CCW. 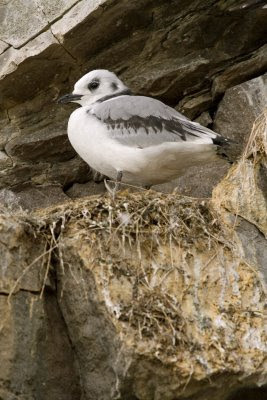 Lots of the young Kittiwake are now fledging and can be seen flying around their cliff-colonies. They are beautiful birds and stand out from the adults by the striking black patterns on their wings. The last week on Skomer has seen a frustrating mix of weather. One minute some lovely hot sunny spells and the next torrential downpours on an impressive scale. The downpours seemed to coincide perfectly with the arrival of day trippers, thankfully most of whom were prepared with full waterproofs. One good thing about being on the island in this kind of weather is that you get to see the weather coming, and sometimes have time to seek shelter in a hide or at the Farm buildings. It is exhilarating to watch a rain shower sweeping in across the sea, knocking down any chop or white water and forming a drifting curtain that gets closer and closer. Torrential rain turning the courtyard into a muddy lake. The Guillemots and Razorbills have now virtually all gone. There are a hand full of Guillemot chicks still to go and one or two Razorbills left. Some of the adult Guillemots hang around on the cliffs for a week or so after the chicks have left, but even their numbers are declining significantly now. The Fulmar eggs are hatching and some of the young chicks have been seen - the adults don't leave them whilst they are small. There are some Little Owl chicks that have been showing well and the Short-eared Owls are seen out hunting most days. Oystercatcher roosts are beginning to build around the coast and we are seeing a few birds passing through. Yesterday two Herons flew over being mobbed by the Gulls and two Cuckoos were recorded. The boatmen saw the first Sunfish of the season yesterday - these bizarre fish are shaped like a round dish and are often seen lying on their side basking in the sunshine. They can grow to 3m in size but the ones seen around Skomer are generally smaller at 1 to 1.5 metres. We normally see Sunfish in the late summer as they follow the blooms of jellyfish that they feed on. When the wind blows....The ferry might stop. Although the sun has been shining this week, strong north westerly winds on Tuesday and Wednesday meant that the boat was unable to bring any visitors across to the island. Sadly the forecast for the weekend is unsettled....... it might rain......... it might be windy. Or.....it might not! This is one of the things you have to accept about islands, the weather is particularly unpredictable and effects everything that happens out here, there is just nothing you can to do to change it. On top of that there is the effect of the tide to be considered. The difference between extreme high and extreme low tide around the island is about 7 metres, that's vertical distance, and constitutes a HUGE volume of water. This water has to pass through Jack Sound, a 550 metre gap between the mainland and Middleholm Island. Jack Sound is relatively shallow and littered with submerged rocks. The tide rushes through the Sound at over 6 knots - that's faster than you can jog - and causes all sorts of eddies, swirls and upwellings. If wind and tide run in opposite directions the winds whips the sea up into even more of a choppy nightmare. Those two days of windy but mostly fine weather meant that the staff and volunteers had ample time to get on with lots of work. We continued bracken bashing, an unpopular but very necessary activity. This basically consists of heading out with various lengths of bendy pipe, broom handles and old tennis rackets and beating the hell out of the Bracken. As well as dealing with any pent-up anger issues and creating brilliant callouses on your hands this is an effective way of managing the spread of Bracken on the island. Due to the fragile nature of the island we cannot use more conventional Bracken control methods - cattle, machinery or chemicals. The first two would crush the Manx Shearwater burrows and the last may damage the other plants and lichens that flourish out here. We also helped to ring nearly 300 Lesser-black Backed Gull chicks. This is part of a long running study into the breeding success of the Gulls run by the Edward Grey Institute. The last week has been great for Puffin watching and the visitors have been treated to great views of these enigmatic birds, whilst the resident staff, volunteers and researchers have been able to take a bit of time out to enjoy Puffin watching before the birds leave the island and return to sea. By the end of July there will be few Puffins left. At the moment the breeding population of approximately 13500 birds is swelled by many thousand more non-breeding birds. Puffins do not breed until they are 5 or 6 years old but they return to the colonies in late June and July when they are about 3 or 4 years old and start looking for a burrow and a mate. At the moment there are lots of these 'teenage' birds hanging around in the evenings. They are busy poking their heads down burrows, socialising with other youngsters, pulling up bits of vegetation to line imaginary nest chambers, carrying around stones and digging at little depressions in the ground to try to form burrows. Puffins display a whole range of behaviours that are easy to observe, but harder to interpret. People often regard them as cute and amusing characters but the reality is that that their short time spent on land is fraught with danger and filled with social interactions that must be exhausting. As with all the seabirds they are not 'at home' on land and only when they return to sea are they truly in their element. For the Puffins on Skomer it is now just a week or so before they return out to sea, not to make landfall again until next March. Gape - This is a threat display (a bit like sticking your tongue out at someone, but more serious!). This display has different levels of intensity, a bill held slightly open shows a low level of irritation, a wide gape (as in the video) shows the bird is seriously annoyed and if the other bird doesn't back down it can lead to a fight. Used by birds protecting their burrows and burrow entrances (ie their territory) but in the video these are probably 'teenagers' learning the ropes. Billing - This is a courtship behaviour and can be likened to kissing, aaaah! Usually between a pair and used to increase their bond, although in the video it is probably some young non-breeding birds. The action and sound of clashing bills often attracts other Puffins that scurry over to watch and may try to join in. Billing is often contagious and other pairs nearby will start, spreading the Puffin love!! Rain, don't come back another day, just go away! It was another uneventful day here on Skomer, due to the never ending rain which we received today. Some day visitors braved the weather and ventured out onto the island, with some brief sunny spells they caught some glimpses of the Puffins. The staff enjoyed a lovely curry night, made by Holly, Ben and Dave who are the researchers here on Skomer. Everyone had a wonderful meal and we are all very grateful to them for making the amazing meal! Who said island life had to be basic, hey!? One of the highlights of Skomer at the moment is the oldest puffin recorded on the island, which was tagged as a young adult in 1982! 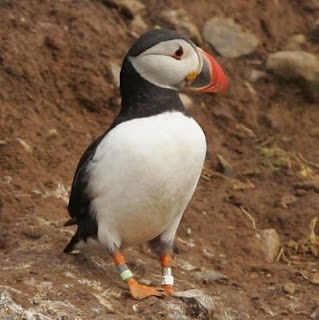 It is still seen here on Skomer, and Dave B the researcher has been monitoring it closely over the past 8 years! Hard to imagine it returns every year since then! Below you can see the picture of the Puffin here on Skomer. Another beautiful day here on Skomer today, quite the contrary to yesterday! It was another bustling day with visitors hoping to catch a glimpse of the Puffins at the Wick. Most were out fishing at sea in the morning, but as the day drew on they quickly returned to the relief of the day visitors! Although they quickly fly into their burrows, due to the over head gull mob which watched them closely as they returned home. The Lesser and Greater Black back Gulls often attack the Puffins in order to retrieve the precious sand eels the Puffins bring in to feed their hungry chicks. Although, the gulls only scare the puffins into dropping their meals as they return to the burrows. Later on that day I set out to do some of my dissertation work which I am doing out here on Skomer, alongside my Volunteer duties. My research topic involves monitoring the vegetation diversity of the Rabbit exclosures compared to the outside vegetation. Rabbits are one of the main grazing animals here on Skomer they greatly effect the vegetation, although many are dying from Myxamotosis which is rife here on Skomer. I monitor the vegetation by doing a 30-40m transects line, and measuring percentage cover of different species of plants along each 1m in a 1m squared plot. I first got the idea from this project when I volunteered on Skomer for one week 3 years ago. This was a great experience for me, and I have returned every year since and helped with a lot of research on the island which is a great way to get experience in conservation! Some of the work I helped out with is vole monitoring, Lesser Black back Gull ringing, Seal pup marking and vegetation monitoring. Anyone who is looking to work in the world of conservation should come and spend a week volunteering here on Skomer as it's a great stepping stone, and you can gain a lot of vital experience needed in this area of work. I applied for the long term placement here on Skomer as part of my scholarship, which I receive from the CCW (Countryside Council of Wales) for being a bilingual Welsh student at Aberystwyth. Through this scholarship I had to do a 5 week volunteer placement, and I thought the long term volunteer position here on Skomer would be a great experience. As the CCW own the island, and is then maintained by the Welsh Wildlife Trust, you can follow the link in order to find out more about the CCW and its involvement in the island. Yet again, more and more of the Puffins are leaving! Sam, Tessa and Jerry saw some wonderful Puffling sights in the evening (see here). They are becoming more active and stretching their wings outside the burrows more often. If anyone is hoping to see the last of the Puffins, you had best hurry, they will be leaving soon!! The rain seemed relentless today, the gorgeous sunshine we received yesterday seemed ages away today! With only 66 visitors today, it seemed many people were put off by the weather. But, many of the lucky visitors witnessed puffin chicks venturing out once again into the daylight in order to stretch their young wings. The rain seemed to draw everyone inside today, and it was dubbed a baking day! Sam, Tessa, Jerry and I made some lovely cake and pizza, and it was greatly enjoyed by all the staff on the island. Pete, Jo and Dave enjoyed a day off on the mainland, to return to the drizzle of Skomer Island. Sam and Tessa discovered a Common Emerald in their moth trap today, which is rarely seen on Skomer! This trapping device is set every night, with a bright light drawing in the moths in order to monitor the species diversity on the island. Be quick if you're coming to visit Skomer Island for the Puffins, they will be leaving very soon! Skomer Island has its usual bustling day today, with puffin chicks venturing out into the day to stretch their wings under the watchful eye of their Puffin parents. We were also graced by a cuckoo that was being mobbed by a group of swallows, but still managed to gleam into the summer sun! We were lucky enough to be able to book a evening trip to Grassholm, where all the staff and 2 volunteers were able to go and visit the huge Gannet colony on the 'Concerto in Cm'. This was run by the Dale Sailing company, that also runs the Skomer and Skokholm trips. We are very grateful to John for allowing us to come aboard and to give us this great experience. So at 5pm we all set off on the Concerto in Cm, and all were excited to go and visit the unknown island which occupied the horizon from Skomer Island. As we reached Grassholm we were overwhelmed by the white cliff faces of the Gannet colony, sprinkled with thousands of Gannets chicks and adults. The sky around the island was full of flying Gannets and young fledglings, which were venturing out to sea to search for food. Everyone took a lot of photos of the birds and the island hoping to catch that one perfect picture of the Gannets. We then left Grassholm and sailed on to The Smalls, where there is a huge lighthouse placed on top of a rocky outcrop in the middle of the sea, a 1/3 of the way to Ireland from Pembrokeshire. 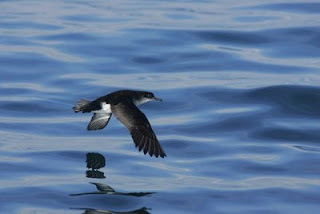 Here we were able to see flying Manx Shearwaters and Storm Petrels, out fishing in the sea in order to feed their young when they return to Skomer and the surrounding area in the evening. We tried endlessly to coax more Storm Petrels into our area with Cod Liver oil Rice Krispie Treats, but unfortunately it was unsuccessful. After an hour of enjoying the evening sun, and the amazing wildlife at the Smalls, we sailed back to Grassholm and on to Skokholm Island. The beautiful Red Sandstone of Skokholm gleamed reds and purples all along the cliff faces, and the lighthouse, which is situated on Skokholm, sparkled against the setting sun. We then returned to Skomer, floating into the sunset, which was quite a breathtaking moment. All in all, it was a great evening, and everyone on board the amazing Concerto in Cm was completely overwhelmed and amazed at how spectacular the experience was. We were all very grateful to Jo and Dave who organised the trip, and to Dale Sailing for running the trip to Grassholm. That experience will be hold dear to us for a very long time, Thanks again to everyone who was involved!!! Dave and I went over to the mainland today to retrieve some bottles of water, Skomer Guides and Bird guides which we sell at the sales point on Skomer Island. We took the Skomer boat over, and the sea was remarkably calm, and the weather was as sunny as ever! We retrieved the stock that was needed for the island and quickly loaded it onto the boat in order to get back to Skomer. In doing so, I had a rather unexpected trip and fell into the sea, and soaked my trousers! Oops! The on-lookers who were waiting for the boat to return had a rather comical spectacle to look upon, and found it greatly amusing, and applauded! Unfortunately, I lost my phone in the process, and I am currently trying to bring it back to life again, fingers crossed it'll work out!!! A phone full of water. Will it work again? So after a short outburst of laughter from both Dave and I, we set off back to Skomer Island. Then, I did another spectacular trip and fell head first into the sea, much to Dave's amusement! I got back up, completely soaked to the bone! The sea was quite refreshing, but rather enjoyable never the less! So, all in all, it was a very pleasant day for myself and Dave on our jolly trip to the mainland and back! Apart from that, I looked forward to a visit from my friends Lyn and Dave. We all held a lovely BBQ outside, and everyone had a great time! Sam made a wonderful salad, and we all tucked in to some lovely chocolate bread and butter pudding for dessert, that Dave had made previously! The wick has been very busy lately with the puffin chicks beginning to fledge! Many of the chicks that are almost ready to leave can be seen stretching their wings in daylight, and many lucky visitors have been able to see some of these chicks! They are usually surrounded by parents and other puffins in order to protect them from the main predators of the island, the Greater Black Back Gull and the Herring Gulls. I would definitely look out for the spectacle at the The wick if any of you are thinking of coming out to Skomer within the next few weeks! But be quick, they will be leaving soon to embark on their sea bound journey for the rest of the year!